At age sixteen Riley learned that, because of a rare medical condition, she would never be able to have her own children. Devastating news to most young women, especially those who love children and have always dreamed of having their own family. But Riley's response was: Kenya has given me a thousand children. Riley's stories of her trips to Kenya, her struggles to figure out how to best serve and care for these people she has fallen in love with, and her own unexpected health issues are funny, compelling and gripping. Readers will find that God writes surprising stories in the lives of those who follow Him. Hard to put down, Riley Unlikely will inspire you to pursue your dreams and make a difference in your own world-and around the world. 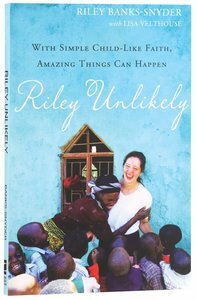 Customer Reviews For "Riley Unlikely"
I just love this book! It's about a 13-year-old who does amazing things, one God-step at a time. By that I mean, she does one little thing; then it leads to another; and another - all the while, God is holding her hand, leading her along, and paving the way. I loved a similar book called Kisses From Katie, but I felt I could relate more to Riley Unlikely, as the things Riley did were things I feel I could do. I really enjoyed this book and think it's a great inspiration for any teenager, who wonders what power they could have on the world. It would be a great gift for your teenager child, to let them realise their potential. It's inspired me and is sitting proudly on my bookshelf, to re-read in the years to come.